I bought my Wii mostly for this 8-bit game and have since geeked out plenty looking up stuff online to help assist me in rescuing that princess who can’t keep herself out of trouble. Also, if you use your first turn to flip over C2 and C3, you can then know which of the eight sets you’re dealing with, with one exception. 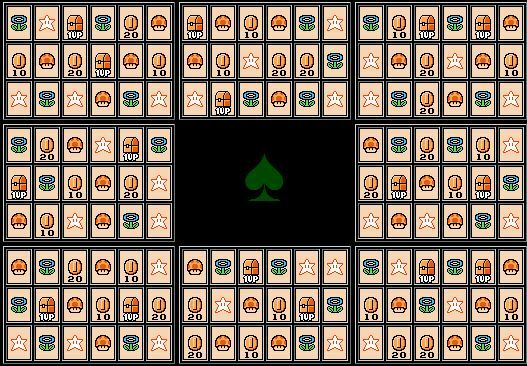 If the cards are Flower and Star, then flip over A1 to know which of the two possible sets you have. Write more about Mario crap YOU LAZY!!!!! Sorry…….just lazy man, good job I have nes also and beat Mario 3.
friends rather than phone call or recommendations.